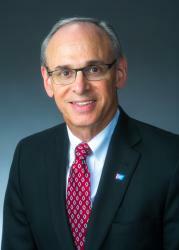 Richard C. Wender, MD, is the chief cancer control officer of the American Cancer Society. In this role, he is charged with providing oversight and guidance to the organization’s domestic and global cancer control programs, with a focus on access, navigation, and health equity in an effort to ensure everyone has an equal opportunity to live a healthy life and receive high quality treatment and support. Dr. Wender leads one of the largest cancer control organizations in the country, with centralized and regionally-deployed staff working in the areas of prevention and early detection, patient and caregiver support, programs and services, global cancer control, and health systems. Prior to joining the Society, Dr. Wender worked for 34 years as a family physician in the department of family and community medicine at Thomas Jefferson University in Philadelphia, most recently as alumni professor and chair. During Dr. Wender’s tenure, the department developed a global health program and focused on a mission of improving outcomes for all, with a particular focus on reducing health disparities. He is also a prolific author, with numerous scholarly works, including co-authoring several cancer screening guidelines. Dr. Wender has been honored numerous times for his leadership in medicine, having been recognized with the Laurel for Cancer Prevention Leadership from the Prevent Cancer Foundation, Practitioner of the Year from the Philadelphia County Medical Society and the St. George Medal from the American Cancer Society.